We're going to Feinstein's tonight. This time, it's to see its namesake Michael Feinstein! 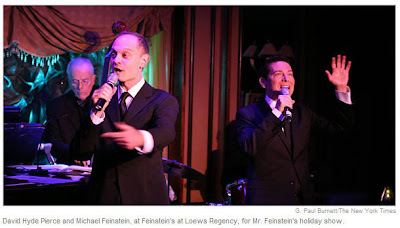 Michael Feinstein LIVE! The bonus of the evening is that the delightfully droll and ever so charming David Hyde Pierce will be performing side by side Mr. Feinstein. I'm so envious - I harbor a deep and abiding crush on David Hyde Pierce.